The question posed to the man in John 5:5-9 appears rhetorical. We do not know if he was born with a disability or his physical limitations are the result of an injury. Regardless, he is accustomed to his place near the pool of Bethesda. He’s resided in that spot for 38 years! He knows the perceptions of how he got there. Surely his parents must have sinned greatly in order for God’s blessing to be withheld. The whispers and stares are not lost on him. He watches those whom wear the badge of “blessed” murmur as they pass his way daily. It’s not an abundant life. But it is what he has accepted. And then he encounters Jesus. He wasn’t even seeking Him. Yet, Jesus approaches the man. Who, would not embrace the offer to be healed? After all, multitudes clamored to be healed through Jesus’ mysterious yet miraculous touch. What appears to be a simple question actually carries with it a complex web of implications. Three years ago, my son became sick. Originally struggling with a chronic upset stomach, epilepsy presented suddenly. Our lives became caught up in a whirlwind of questioning, troubleshooting and despair. Thankfully, God’s mercies held us tight during that year. However, reeling out of that trauma, my son struggled with being made well. As I walked with him in that journey, I reflected on moments in my own life when I too feared “being well,” The voices spoken both audibly and echoing in our heads, appear to hold power and keep us from breaking free. Is it no wonder that the man in John 5 became accustomed to his socially appointed lot in life? We are creatures of habit-even if the routine subtly and deceptively keeps us from being restored-fully whole in communion with God..
My son’s visit to Mayo Clinic included a visit with a psychologist who only sees adolescents with chronic illnesses. Why? Because narrowing one’s identity to fit around the illness becomes tempting. My son was exhorted to not let his epilepsy define him. Our own identities may be informed by life changing parts of our narratives, illness, injury,sinful actions committed against us or sinful areas with which we struggle. Regardless, Jesus has promised us abundant life Healing may or may not happen here on Earth but restoration is always possible. How will he recognize his purpose now? What will it take for him to break through the perception that he is no longer dependent on others for basic needs? How will he establish autonomy? Restoration places us out of our comfort zone; even if the previous zone of habitation limited us. As my son returned to High School for his Junior year, following the previous year of illness, I anticipated that he would welcome the fresh start. However, anxiety filled him as he began. I felt completely blindsided. Why would apprehension fill his heart? He had become accustomed to his lot. Sympathetic teachers. A force of people supporting him. Extra time at home. Transitioning to a posture of empowerment demands walking forward. Even if the ground feels shaky at first. Doesn’t it seem easier in a chronic situation to adapt and accept that God is not capable of Forgiveness? Mercy? Delivery? Healing? Suddenly, his daily rhythm of life is altered. 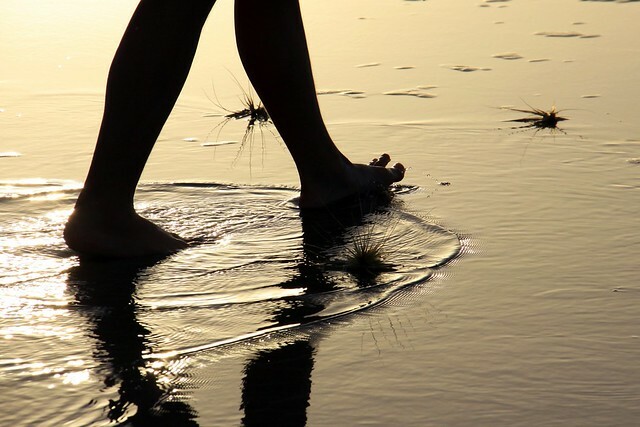 Walking forward demands trusting our sovereign God in our new steps. Acknowledging that we can balance on one leg as we move the other in front in order to stride toward the longed for but unfamiliar horizon. Jesus, who desires my wholeness so much to encounter me when I wasn’t looking for restoration. Jesus, who believes that I am so much more than what I think of myself. This entry was posted in Uncategorized and tagged abundant, anxiety, chronic, comfort, deliverance, fear, forgiveness, healing, hope, identity, illness, Jesus, life, mercy, resore, sin, well on February 11, 2017 by Stephanie.